In Pinto Technology Ventures, L.P. v. Sheldon (opinion here), the Supreme Court of Texas enforced a forum-selection clause in an amended shareholder agreement, requiring much of the underlying equity-dilution dispute to be litigated in Delaware. The Court upheld the clause’s validity and explored its scope, in terms of the claims and issues covered, and its enforcement by and against nonsignatories. Because the forum-selection clause appeared in a shareholder agreement, the Court had no cause to address the looming issue in this area—the enforcement by courts outside Delaware of a clause in a corporation’s bylaws, unilaterally adopted by its board of directors, that mandates exclusive jurisdiction in Delaware courts for all internal corporate claims, including all derivative actions, pursuant to the recently enacted Section 115 of the Delaware General Corporation Law. Sheldon and Konya asserted a variety of claims against the majority shareholders and the officers and directors of their company, IDev, arising from what they contended to be the wrongful dilution of their equity interests. Both had signed iterations of the IDev shareholder agreement. The first two versions of that agreement designated Harris County, Texas, as the forum for any disputes “arising out of” the agreement, but the last three versions prescribed Delaware as the exclusive forum. Sheldon and Konya had not asserted claims for breach of the shareholder agreement itself, urging statutory and common-law tort claims instead. Nevertheless, the Supreme Court held their dispute fell within the “arising out of” language of the forum-selection clause. It rejected the strict “but for” reasoning of the court of appeals majority that, because their claims derived from statute and common law, they could not “aris[e] out of” the amended shareholder agreement. The Supreme Court stated a desire to avoid “slavish aderence to a contract/tort distinction” and to prevent litigants from evading an agreed forum-selection clause through “artful pleading.” Focusing on “the factual allegations undergirding the [parties’] claims rather than the legal causes of action asserted,” the Court found “the existence or terms of the shareholder agreement are operative facts in the litigation,” and “but for” their status as shareholders and as parties to the shareholder agreement, Sheldon and Konya would not be aggrieved. The Court did note that, if the provision had been tied to “claims arising out of” the shareholder agreement, rather than the broader “disputes arising out of” the agreement, the result might have been different—a decision it reserved, however, for another day. Next, the Court examined the extent to which the forum-selection clause should be enforced with respect to those who were not parties to the amended shareholder agreement. Sheldon had signed all but the most recent amended agreement. Konya, however, had signed only the first two versions of the agreement—the versions that specified Harris County, Texas as the exclusive forum—and therefore argued he was not bound by the amended versions that prescribed Delaware as the forum. Not so, said the Supreme Court. Every version of the agreement, including those signed by Konya, provided that it could be amended by agreement of the corporation and the holders of a majority of the voting stock. That protocol was followed in the subsequent amendments that adopted the Delaware-forum provision. And so, the Court said, Konya and Sheldon were bound whether they signed the later amendments or not. Two of the IDev officer-defendants, however, had not signed any version of the shareholder agreement in their individual capacities. Based upon a strict reading of the agreement—which said it conferred no rights on anyone other than the parties—the Court found neither of them could enforce the forum-selection clause against Sheldon and Konya (even if other parties to the case could). In so doing, the Court avoided deciding whether Texas would adopt the “transaction-participant doctrine,” whereby an employee of a party to a contract that contains a forum-selection clause can enforce that clause against another party, like Sheldon and Konya. That question will wait for another day. So, too, must we await some future decision to learn Texas’s response to a Delaware-only forum-selection clause unilaterally adopted by a company’s board of directors and incorporated into that company’s charter or bylaws, all pursuant to Section 115 of the Delaware General Corporation Law. The Delaware Chancery Court approved such a board-adopted forum-selection clause in Boilermakers Local 154 Retirement Fund v. Chevron Corp., 73 A.3d 934 (Del. Ch. 2013), and two years later, that result was codified in 8 Del. C. § 115. 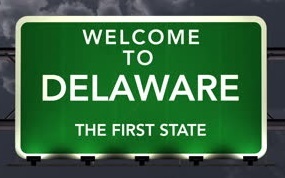 That statute not only allows the boards of Delaware corporations to unilaterally insert Delaware-only forum clauses in bylaws, it also prohibits bylaw or charter provisions that establish exclusive jurisdiction in any forum other than the courts of Delaware. So, a company incorporated in Delaware, whose headquarters and operations are in Dallas, cannot adopt a bylaw that makes courts in Texas the exclusive fora for resolving intracorporate disputes. Neither can it adopt a bylaw that requires such disputes to be resolved only by arbitration, because that, too, would deprive shareholders of access to Delaware courts. Other states’ reactions to this Delaware-centric provision are still developing. Oregon’s Supreme Court, for example, has approved and accepted it, in Roberts v. TriQuint Semiconductor, Inc., 364 P.3d 328 (Ore. 2015). Texas has yet to weigh in. In any event, legislative history seems to make clear that § 115 has no effect on shareholder agreements, and so provisions there that require disputes to be resolved in arbitration or in the courts of a state other than Delaware will survive. See Bonanno v. VTB Holdings, Inc., C.A. No. 10681-VCN, 2016 Del. Ch. LEXIS 24 (Del. Ch. Feb. 8, 2016). In Texas, the Supreme Court’s guidance and reasoning in Pinto will continue to control such cases.